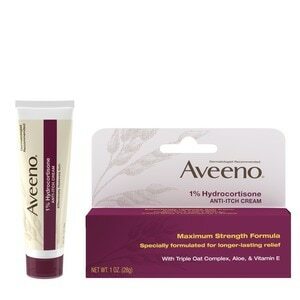 Aveeno 1% Hydrocortisone Anti-Itch Cream features a maximum-strength formula designed for effective, longer-lasting itch relief. Enriched with Triple Oat Complex, aloe and vitamin E, this skin-soothing cream provides temporary relief from the itching and redness associated with minor skin irritations, inflammation and rashes. It's suitable for use on skin affected by eczema, seborrheic dermatitis, psoriasis, insect bites, poison ivy/oak/sumac, soaps, detergents, cosmetics, or jewelry. From the dermatologist-recommended skincare brand for over 65 years, Aveeno uses the goodness of nature and the power of science to keep your skin looking healthy and feeling balanced.